This Mother’s Day, together with our earthly mothers, let us honor the mother of the Lord. She who is the mother of the head of the body is also mother of all the members of the body. In this post, we’ll take a look at the story of the Mother of God in iconography. In the first icon we view the Nativity of the most holy Theotokos. According to tradition she was born to the elderly, barren parents Joachim and Anna. “Isaiah says, ‘The root of Jesse shall come, He who rises to rule the Gentiles; in Him shall the Gentiles hope’” (Rom. 15:12; cf. Is. 11:10). “Rod of the root of Jesse, and flower that blossomed from his stem, O Christ, You have sprung from the Virgin.” (St. Cosmas) The most holy Virgin is the rod and Christ the unfading rose that blossomed from her. The Entrance of the Theotokos into the Temple. According to tradition at the age of three the most holy Virgin was brought to the Temple, where she stayed for nine years. 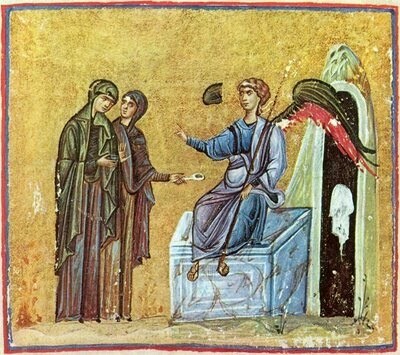 The Evangelismos, or the Annunciation of the Good News of the Theotokos (see Lk. 1:26-39). “You will conceive in your womb and bear…the Son of God” (Lk. 1:31.35). “And she gave birth to her first-born son and wrapped Him in swaddling cloths and laid Him in a manger” (Lk. 2:7). The Circumcision of the Lord. He truly assumed human flesh, willingly accepting to undergo everything the Law required (cf. Lk. 2:22-39). The Flight into Egypt (cf. Mt. 2:13-23). James, “the brother of the Lord,” is following. According to tradition he was Joseph’s eldest son. The 12-year old Boy Jesus at the Temple. “‘Son, why have you treated us so? Behold, your father and I have been looking for you anxiously.’ And he said to them, ‘How is it that you sought me? Did you not know that I must be in my Father’s house?’” (cf. Lk. 2:41-52). The synoptic gospels mention only Joseph of Arimathea taking down the body of God and wrapping it in a linen shroud. John adds Nicodemus. The synoptics mention “the other Mary,” who, according to the Fathers of the Church, is none other than the Mother of God, who, from John’s account, we know she was present. 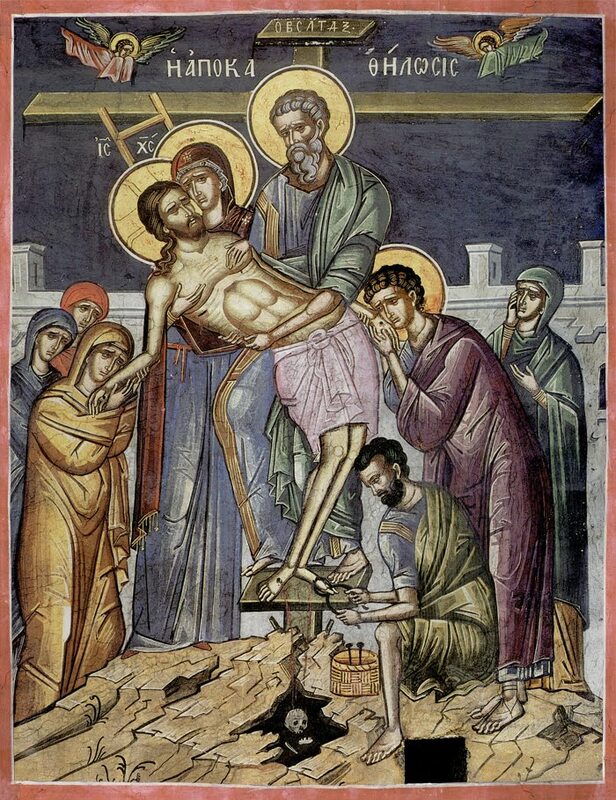 “Now after the Sabbath, toward the dawn of the first day of the week, Mary Magdalene and the other Mary went to see the sepulcher…But the angel said…‘Do not be afraid…He is not here; He has risen…Then go quickly and tell His disciples that He has risen from the dead’” (Mt. 28:1.5-7). “And behold, Jesus met them and said, ‘Hail!’ And they came up and took hold of His feet and worshiped Him” (Mt. 28:9). While the gospel accounts mention only the disciples being present at the Lord’s ascension to heaven, in this ancient depiction the most holy Theotokos stands in the middle, as the Apostle Paul is shown on the left. The descent of the Holy Spirit upon the twelve disciples and the holy Theotokos. In the description of the Acts, “When the day of Pentecost had come, they were all together in one place” (Acts 2:1). By “all” many understand to include “the company of persons was in all about a hundred and twenty” (Acts 1:15), which includes “the women and Mary the mother of Jesus” (v. 14). The Dormition, or the Falling Asleep, of the Theotokos. Ivory, Constantinople, circa 1000 AD. The Metastasis of the Theotokos, literally her bodily translation or translocation, most often rendered in English as Assumption. According to the tradition of the Church, the holy Theotokos died, but after three days her tomb was found empty, having been taken bodily up to heaven to be with her Son. Panagia Pantanassa, The Most Holy Virgin, Queen of All. Following her bodily ascension to heaven she reigns supreme as the Queen of the Angels and Mother of all humans, and intercedes to her Son and our God for our salvation. Next story Do all Religions Have the Same Heavenly Father?